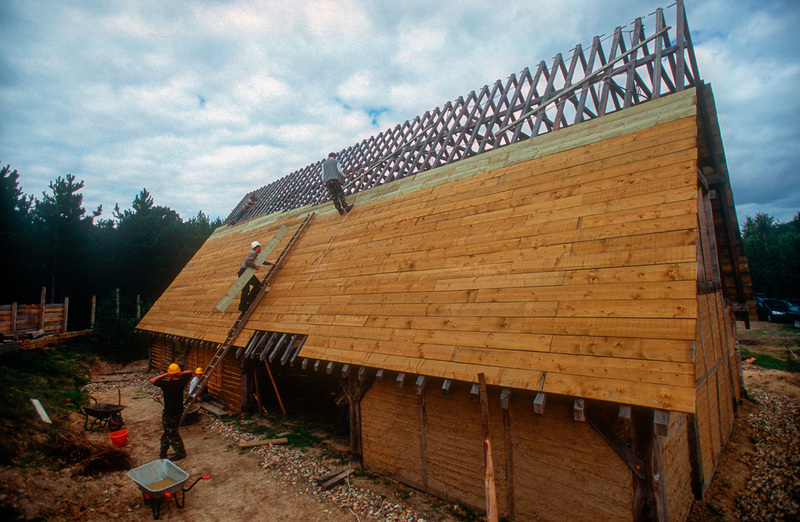 BBC - MYTHS AND HEROES: ARTHUR - THE ONCE AND FUTURE KING: Saxon Longhouse at Wychust, Kent. Saxon Longhouse at Wychust, Kent. The softwood sarking boards being put on ready for shingling with oak. "The site was cleared in 2001 and work on the Longhall commenced at Easter the following year. At the end of 2004, the main structure of this 20m × 10m × 10m building was completed and before the onset of winter, we had clad most of the roof with softwood sarking boards, awaiting the first 10,000 hand-cleft oak shingles for delivery in 2005. That year saw the completion of the porches and the commencement of the huge task of nailing on the shingles. Walling advanced well, too. In 2006, the front roof was completed and shingling advanced about a third of the way up the back roof. The walls were completely infilled, doors and hinges were fitted and our hall was secure for the first time. 2007 saw the completion of shingling, some 18,000 eventually finding their way onto the roof. It is an impressive sight and is certainly the largest reconstructed early medieval building in private hands in Europe. Built entirely of English oak, all of which has been harvested from trees growing in Kent, (many within a couple of miles of the site), the site in general and the Longhall in particular, has been conceived, planned, purchased, designed and constructed by our members. What you see is the result of many long hours of research, discussion and the practical application of skills with which our ancestors would have felt at home."